We’ve taken our two most popular ladder rack and combined them to make the ultimate storage and access ladder rack on the market today. These all aluminum ergonomic racks allow you to load and unload ladders by yourself with minimal arm and back strain. On the street side with our Lock-Down rack an easy pull of the handle secures or when ready releases your ladder allowing you to easily walk the ladder off the rack. We’ve taken our two most popular ladder rack and combined them to make the ultimate storage and access ladder rack on the market today. 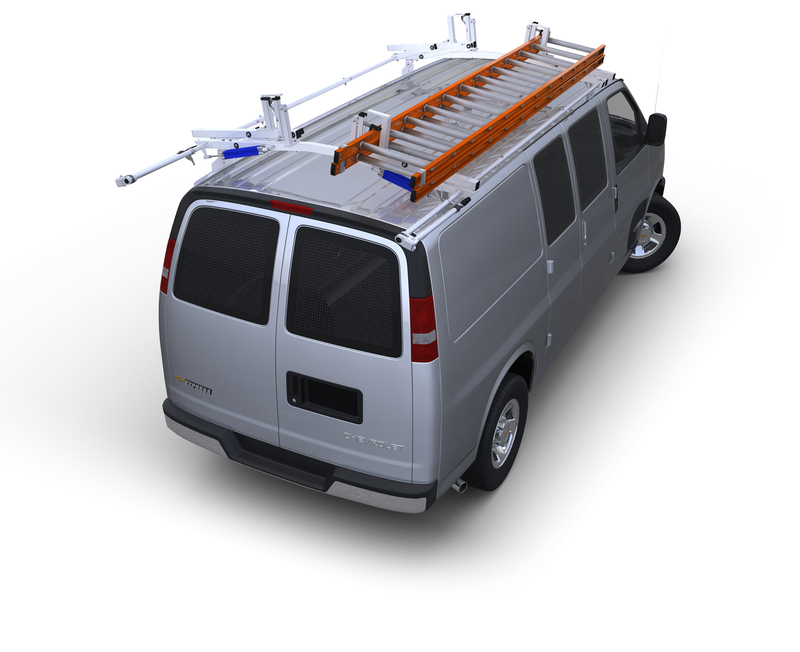 These all aluminum ergonomic racks allow you to load and unload ladders by yourself with minimal arm and back strain. On the street side with our Lock-Down rack an easy pull of the handle secures or when ready releases your ladder allowing you to easily walk the ladder off the rack. On the curb side our Rotation Rack includes a Hydraulic assisted rotation that provides a smooth and effortless decent of the ladder to where you can easily remove it from the rack without reaching or stretching. Also available with extra cross support for carrying shorter loads. This all aluminum ladder rack comes complete with stainless steel hardware and is protected by a durable white powder coat finish. Racks mount in supplied mounting channels which attach to roof at OEM provided mounting points.